Even though it is an exceptionally hot day today on the Amalfi coast, they skies turned pale blue ushering in breezes from Africa, you should not miss the opportunity to try (in any pasticeria (Bakery shop) the Naples area specialty "Sfogliatella di Santa Rosa". Legend says it was invented in a monastery Santa Rosa, situated next to Amalfi in Conca dei Marini. 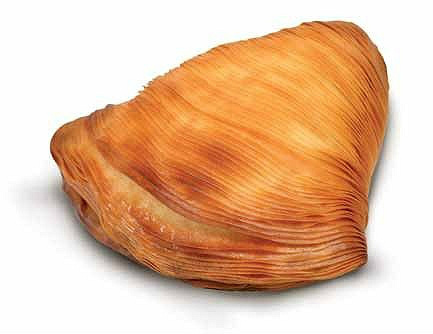 It comes in different varieties as you can see following this link "La vera sfogliatella". Basically it is pastry dough filled with vanilla cream, slices of dried lemon or orange peel, whatever available.